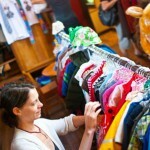 Bargain hunters alert: The Underground Thrift Store at Plymouth Church features 25% off all clothing beginning this Sunday, July 22. You’ll find a “curated collection of upscale and designer clothing and accessories for women, men and children,” along with collectibles for the home. Location: Upstairs at Plymouth Church, 65 Hicks Street between Orange & Cranberry streets in Brooklyn Heights. Summer hours are Sundays from 11:30 a.m.-3:30 p.m.